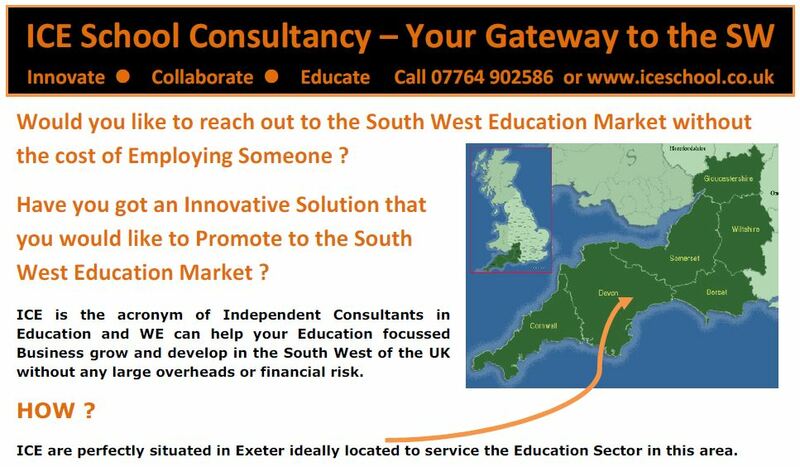 From inception in 2015, our in depth understanding of the Education market and the Challenges Education companies face generating Opportunities in the South West helped forge our Solution...ICE Consultancy to help Grow your Business. A growing number of EdTech start ups are London Centric, an Innovative Hub for advancing Educational Technology with the ultimate aim of Improving Pupil Outcomes and enhancing the capabilities of teachers- but how do you reach the wider Local Authorities? ICE Consultancy solve the issue, allocating an experienced Education Consultant to work alongside your Company to Increase penetration in the South West, without the obligations associated with recruiting a Full Time Employee. ICE are perfectly situated in Exeter ideally located to service the Education Sector in this area. ICE have successfully been working with SW Schools on a variety of Projects since 2000 and in this time have established a unique network of School contacts who trust our experience and Consultancy. All staff are Enhanced DBS Cleared. Because of our reputation we only work with organisations after in depth meetings with full integrity checks ensuring compliance with our non-competition measures when working with similar Business Interests. ICE believe in working in Partnership with your Company and provide a free initial Assessment to clarify your requirements and objectives and agree a Suitable cost effective contract. ICE are totally Independent and our advice in ultimately recommending the most suitable School solutions are Valued by 1000’ of Schools in the South West. ICE Team members once trained in your solutions are able to manage the entire Sales Process including: Prospecting, Consulting (Sales Visit), Supply of Service, Install (if required) and Train on the most advanced Innovative and Collaborative Solutions. ICE have experience in Assessment, Compliance, MIS, E-Learning, VLE’s, Technology, Software, Safeguarding and GDPR to name a few.